Apothecary Thomas Smythe has been betrayed by a fellow knight in the Order of the Hospitallers in a foreign war. 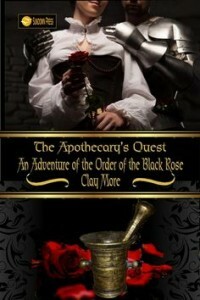 Home in England once more, Thomas lives out his life as a simple apothecary. When he is summoned to attend Sir Percival Fitzroy, who has been taken ill, Thomas realizes that Lord Fitzroy has been poisoned. A trap, set in motion by a craven knight from Thomas’s past, threatens to see him murdered, as well. But can he reach Sir Richard de Vere, a man he suspects may hold the key to the mysterious death of Lord Fitzroy—and will Sir Richard help him? For Lord Fitzroy has entrusted Thomas with a quest for the Order of the Black Rose, a secret society that could accept him as one of their own…or have him slain.